When your foodservice operation needs a commercial oven repaired or maintained, GP-ServiceDirect the service division of General Parts Group is here to help. Located at 10403 Baur Boulevard, Suite H, St. Louis we are conveniently located to serve the greater St. Louis area. Every service call is taken care of by one of our industry-certified and factory trained technician staff. Each team member possesses the knowledge and experience to perform any restaurant equipment repair as well as the HVAC system, refrigeration and ware-washing systems in your operation. For more information, give us a call at (630) 595-3300 or email StLDispatch@GP-ServiceDirect.com. Emergency services – No matter the time of day, we understand the need for immediate foodservice equipment repair and the benefits that it can have for your business. GP-ServiceDirect offers 24 hours emergency service service. Personalized repair procedures – We understand every kitchen is unique, that is why our tailor planned maintenance programs are built to ensure that our restaurant equipment repair services take these differences into consideration. No matter what kind of food you are serving or the nature of your kitchen’s design, our services will ensure that all needs are accommodated. Qualified repair technicians – Our entire team of commercial appliance repair technicians is factory trained and industry-certified, possessing all of the knowledge and know-how needed to keep your kitchen functional. Hiring our experts at GP-ServiceDirect will guarantee you quality and effective services that are unmatched by local competitors. Small commercial kitchen appliance repair – We have an onsite repair shop at our office where our technicians work on our client’s equipment. Any piece of equipment that can be carried, is welcome. Equipment installation – If the time has come to replace equipment, our certified technicians can install most brands. Constant communication – At GP-ServiceDirect, we understand the need to be involved in everything that’s going on in your kitchen. To satisfy this need, our Automatic Status Update System ensures that you are kept abreast of the status of the repairs and procedures that we are conducting. Online account information – Access to account service histories, open & closed tickets and more is available from our online Customer Portal. Click here to request access. Quality parts – For every repair, our technicians have access to the vast inventory of O.E.M. parts from our parts division – GP-PartsDirect. For those that prefer to repair their own equipment, all parts are also available on our e-catalogue at GP-PartsDirect.com. Ground shipping is free on parts that are picked up at our St. Louis location! 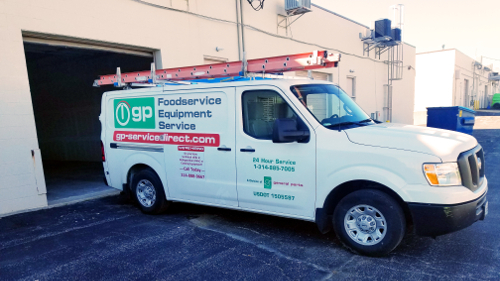 Warranty – Our team at General Parts Group respects the unique nature of every commercial kitchen and the importance of providing a customized approach with effective service. This is why we include a 90-day labor warranty on our work as a sign of our commitment.